Domain-driven design (DDD) is a set of modeling techniques that can facilitate systems thinking. Adopting systems thinking is critical for designing effective UX research, particularly at the enterprise level. Enterprise software is a complex ecosystem that propagates data from one set of applications to another, typically with no explicit articulation to the user of the rules that govern this flow of data. Making key software-architecture decisions based on an understanding of user needs regarding the transmission of data throughout this ecosystem is essential. Domain-driven design (DDD) is a set of modeling techniques that can facilitate systems thinking. DDD is an approach to modeling software that accounts for business processes by explicitly articulating the relationships among teams and technical systems with the intent of accelerating the discovery work that is necessary to iterate on existing software. The DDD concept of context mapping is a way of illustrating particular types of relationships between both teams and technical systems. The DDD concept of context mapping is a way of illustrating particular types of relationships between both teams and technical systems. It’s important to understand these relationships from a UX perspective because they illuminate how interactions between enterprise systems can exert significant impacts on the user experience. In this article, while I won’t elaborate on all of the different types of context mapping that the DDD approach comprehends, I’ll instead focus on a specific type of context mapping called the customer-supplier relationship. The customer-supplier relationship describes how two internal teams—and by extension, their associated systems—might relate to each other. Figure 1 illustrates this relationship. 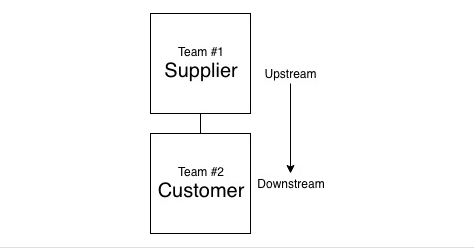 The supplier is upstream from the customer and, therefore, provides data to the customer. The customer and supplier teams must work together to ensure that customers receive what they need. The type of information the supplier propagates downstream determines whether the customer’s needs are met. To make this relationship more concrete, let’s consider a real-world example. Imagine a call tracking-configuration application that lets users associate specific tracking numbers with certain marketing events. For example, users might want to set up separate tracking numbers for phone calls coming from an email-marketing campaign versus phone calls coming from visits to a specific landing page. This call tracking-configuration application has enormous power to influence the data it sends to downstream applications. So, now, let’s also imagine that this configuration application affects the downstream team that is responsible for building and maintaining analytics reporting. 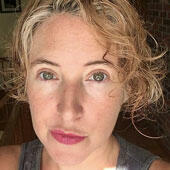 Their reports provide information on the efficacy of various marketing strategies. For example, they can answer questions about whether the email-marketing campaign has generated more phone calls than the marketing campaign driving users to a specific landing page. To obtain clean, interpretable data in the downstream application, it’s necessary to be very careful about allowing users to add, define, and manipulate information in the upstream configuration application. To obtain clean, interpretable data in the downstream application, it’s necessary to be very careful about allowing users to add, define, and manipulate information in the upstream configuration application. Figure 2 provides an example of the relationship between the configuration application, or supplier, and the reporting application, or customer. The teams that support these separate, but interacting applications must work together to ensure that they meet the customer’s needs. From a UX perspective, it’s important to examine user needs in the downstream application first so you can understand how to structure the upstream application. The downstream application is where the impact of the configuration application manifests most directly. 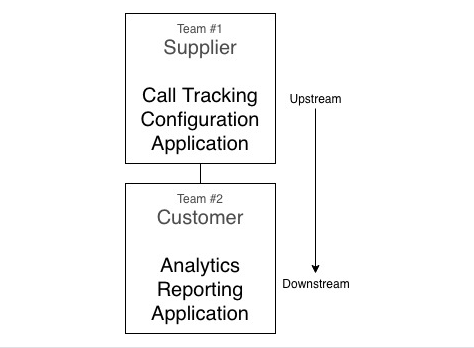 Although the downstream application is reliant on the upstream application from a technical perspective, from a UX perspective, the upstream application should function in the service of the downstream application’s needs.